Can very distant and unfamiliar places or topos become significant? Can the aural immersion with the help of coherent images bring us to these places? How can one create the context for different aural awareness to become possible, that of the listener and of the performer? How can one perform the field recordings? Peter Cusack (UK) was in residency at Q-O2 from 17/01/2016 to 15/02/2016. The main focus for Peter Cusack was to explore the performance possibilities using environmental recordings. He was particularly accentuating the interest to combine the sonic material that he had gathered and still images that he took in the same places where the recordings where made. As a performer, he was interested to play with spatiality of the place, while using the 4 loud-speaker sound system. A big part of his time was spent developing guitar pieces with the Sound Lab System, which connects the guitar with computer software, and allows controlling sounds with switches and pressure pads. One of the performances was given during the event La Semaine du Son at Point Culture in Brussels. During that evening the audience could hear the guitar pieces and field-recordings played through 4-loudspeaker system. Still images appeared synchronically with the played back audio material. Each listening sequence followed by insights and comments of Peter himself. From 13th to 14th of February, Q-O2 hosted a SoundLab offering to a public a two day workshop series on a topic Performing Field Recordings. On the first day Peter Cusack gave a lecture on the subject, had a listening session, proposed hands-on exercises and shared his skills as field-recordist. On 14th Ruben Nachtergaele continued to work in the similar manner, encouraging discussions between the participants and sharing his practices as an artist. Though field recording techniques are very different and possibilities for that are vast, Peter has intentions to continue exploring this further, by bringing in the guitar pieces more often and maybe even finding ways of using light/images more performatively. He is as well interested in finding alternatives for the Sensor Lab system, since it allows him to work with his guitar using software, and find. The only thing which becomes difficult while working with Sensor Lab system is that it's extremely hard or impossible to repair, so one has to think of possible alternatives. What influence the sound has on us? How can the sonic awareness change our relation with our neighborhood, local community or with our city? Can we develope a structure or a technique to follow and represent these changes, produced by sonic environment? During the residency at Q-O2 from 17/01/2016 to 06/02/2016 Caroline Claus (BE) was engaged in several parallel activities. 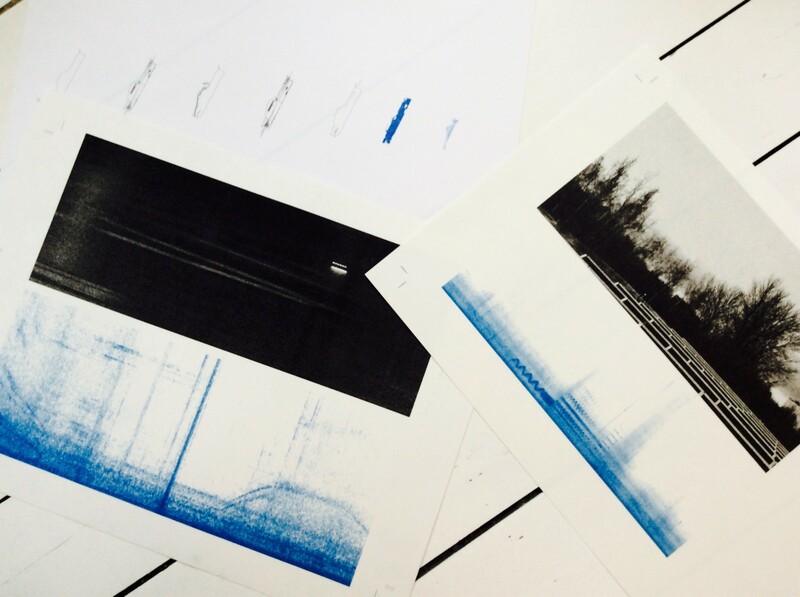 Caroline started her residency with the presentation of her recent publication “Urban Sound Design Process”. The book aims to explain the design process as such and gives a deeper introduction and context for sound-walk project that Caroline wishes to develop. At the same evening Daniel Brozek made his final presentation of spacial-sound installation. Caroline wished to come up with the different representational methodologies that could help to decode and translate the city’s landscape into something more expressive, palpable and unifying. According to her, each artistic practice, analysis or observation, creates new perception points, and in doing so, adds something unique and peculiar to the understanding of the city. In order to render the observed connections between architectural, social and sonic layers of the city visible, she has chosen to redefine the classical map structure, and represent the collected data in a form of visual sound map. Visualization of the sonic environment, for Caroline, is one of the ways to unify simultaneous and fragmented pieces of individual and collective discourses that one can easily notice while spending. Caroline spent some time experimenting with the printing techniques, in order to try to show how one creates visual links between the internal and external points of the same urban context. 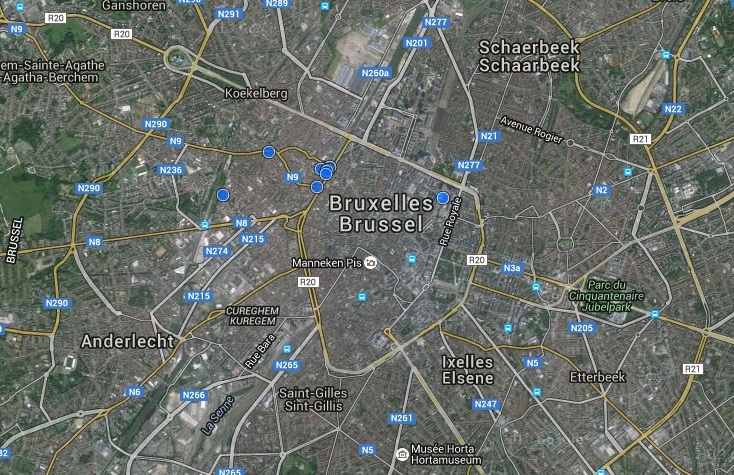 It’s been more than few years that Caroline goes back and repeatedly investigates some areas of Brussels – sonically and from the perspective of urban planner, designer. She’s interested in merging these approaches, connecting them together. In order to share her insights, she invited the public for Open Session. The participants of the Open Session Workshop were guided to the site in Molenbeek, which is situated between the East Train Station and Osseghem metro station. The reason to initiate this particular fieldtrip came out of need to show how one can explore the richness of sonic environment that the area has to offer. An afternoon walk in poor neighborhood on a rainy day became a unique experience, firstly, because of the stories that participants shared during the trip, eventually touching on the history and social reality of area. Secondly, because of the unexpected access to the area with abandoned hangars, which, though observed from distance and discretely, allowed to make unique photos and recordings. In the end, all the participants agreed, that in order to get a better picture of the territory and be able to reflect on it, one has to spend more time in the area than one afternoon. Caroline will propose another workshop series in May, 2016. The material for second publication is being collected. SoCCoS is a residency and research network engaging with exploratory music, sound art and culture.